The fog was heavy in the woods this morning as Vixelyn, or Vix as her friends called her, walked slowly through the forest. The trees around her were leafless and eerie under the faint light that filtered through the fog. A slight snow was falling around her, but Vix was bundled in her favorite coat, it’s shiny exterior leaving the snowflakes to slide off again on their journey to the forest floor. Vix came out here to clear her head, when the house got too noisy for her to even hear her own thoughts. It was the cold that drew her out; the chill that brought her body alive when a brisk breeze kissed her soft cheeks. She pulled her long hair over her shoulder and along the collar of the coat, insulating her pale skin. It wasn’t worry that brought her out here this morning, but simply for some alone time. Her life in the city for the last few years had always been a rush, and a snow storm was always an inconvenience in that world. Out here though, snow was a wonder, a memory of a childhood spent laying on freshly fallen snow and tossing it in the air, only to see it fall down on top of her again. She inhaled and brought her legs shoulder-width apart, standing as still as an Aspen tree. 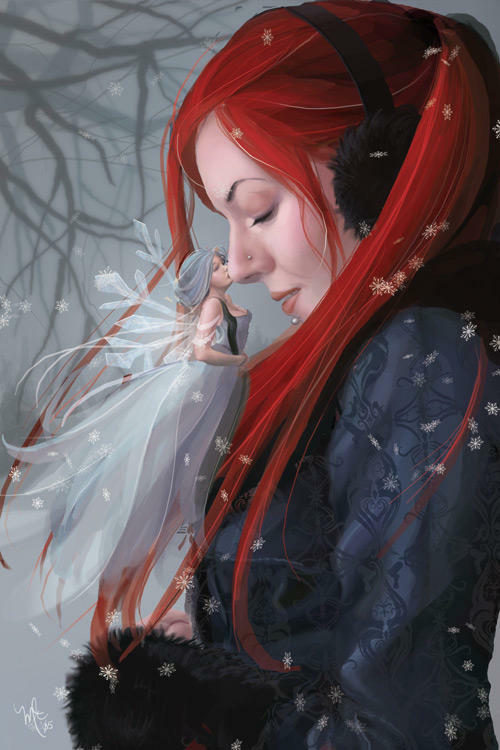 Her eyes closed slowly and her neck relaxed, dropping her chin into the warm cluster of fabric and radiant red hair. She stood there for a long while, exhaling slowly, leaving only a trickle of water vapor streaming out of her mouth. With each breath you could see her body relaxing, only her hands clutched together in front of her stomach showed signs that she was still awake. As the snow continued to fall, a single snowflake drifted down towards her face, drawn to the gleam of her nose ring. It landed gently on the opposite side of the stud, a gentle kiss from the Winter than embraced her. Vix cracked a smile, her lips delicately parting; she had missed these moments, and vowed to herself that she wouldn’t stay away so long next time. This entry was posted in Short Story A Day and tagged Short Story, short-story-a-day on December 5, 2011 by Mario Lurig.